The unexpected can happen to anyone. Dealing with the unexpected is what the members of the OFA can help you do. 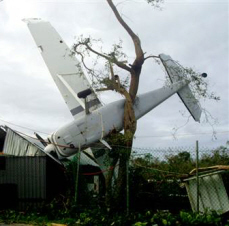 No this wasn't a mechanical problem or pilot error. This damage was the result of hurricane Emily. Wednesday, March 27, 2019 through Friday, March 29, 2019. The OFA will have a brief Executive/Business meeting/coffee Wednesday at 9am at the La Quinta Hotel on John Carpenter Hwy. The meeting will be open to all members. OFA will host its annual reception on Wed Mar 27 at 4pm for SMU attendees. If there is someone you would like to invite to the OFA reception please extend that invite on behalf of the OFA and myself as we are always interested in making new friends and colleagues. Looking for info for the OFA Conference in 2019? at the Sheraton DFW, 4440 W John Carpenter, Irving, TX. Copyright © 2013 C-Notes Site Services. All Rights Reserved.